Just back from London after a really successful workshop on dashboards, displays, reports and other measures to change user behaviour. This was held at the London campus of Coventry University. Strangely that is yo be found near Liverpool Street – and right across the road is the London Campus of UEA. Any other sightings of provincial universities London outlets should be reported here! 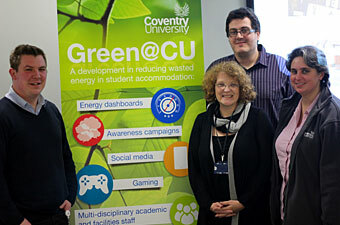 The workshop was an opportunity for the project team from Coventry University to talk about the CUSTOMER project – see an earlier blog posting for details – which has been renamed following feedback from students as green@CU. Also presenting were teams from Manchester Metropolitan University on their engagement activities as well as The University of Bedford on their work in reducing energy use in labs (Project Delta). What was of particular interest this time was the varied communities from which the participants had come and the amount of expertise. The discussion in the small groups was very rewarding as it was instructed by people with handson experience of installing and running energy dashboards and behaviour change programmes around energy use, and people with a research interest in the field. We are now looking at what further workshops on this and other topics on Green ICT we should be looking to run though 2012. Posted by Rob Bristow on February 10, 2012 in Uncategorized. Thanks to the excellent work of our Event Amplifier, Kirsty Pitkin. I like Storify because of the way it weaves together the narrative with video clips, pictures, Twitter feed, slides and other social media. A proper mash-up! Posted by Rob Bristow on December 9, 2011 in Uncategorized.